Sebastian Soderberg, pictured by courtesy of IMG Kenya, is in pole position to claim a historic double at the Barclays Kenya Open after carding a third round of 66 to take a two-shot lead on 12-under-par 201 into the final day at Muthaiga Golf Club, Nairobi. 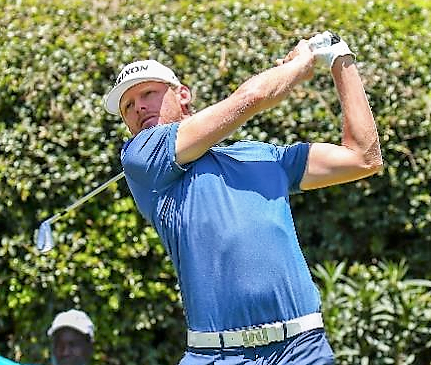 The Swede, who triumphed at neighbouring Karen Country Club in 2016, is seeking to become just the second person in the tournament’s 50-year history to win at both Nairobi courses, with England’s Maurice Bembridge currently the only player to achieve the feat way back in 1968 and 1969. Following a sublime second round of 65 yesterday, the 27 year old played patiently over the front nine today, bagging birdies at the 504-yard par five fourth – where he is a combined four under par after three attempts this week – along with the par four ninth to move one clear of the rest of the field. After an eagle at the tenth and further gains at the 12th and 13th Soderberg pulled away from his nearest challengers, and despite dropping a shot at the 16th he goes into the last round two clear of Germans Max Schmitt and Philipp Mejow. With Soderberg’s sole European Challenge Tour victory coming in Kenya, he admits the country has a special place in his heart – and is somewhere where he seems to play his best golf. “Kenya has always treated me well,” he said. “I don’t really know what it is about here, but I always get some good feelings each time I come back. “Although it is a different course to where I won I always seem to get the numbers right with the distances eventually. The ball can go really far here so you need to be careful with your calculations! “I am very pleased with how today went. It was a really solid round overall and I had a very good stretch in the middle which came from an eagle just after the turn. “It wasn’t the best finish but overall I am very pleased with the last few days. “The greens were definitely getting trickier. They were really firming up today and sometimes it looked as if it was going to be really fast, then it wasn’t, and I did feel like I was struggling a little bit with the speed of the greens today. Fortunately I did make a couple of good putts as well. “I didn’t really think about him [overnight leader Max Schmitt] and I just tried to build on my score from yesterday. I wasn’t hitting the ball very well on Thursday but I started hitting it better yesterday and I am just going to just try and keep doing what I’m doing. Overnight leader Schmitt and fellow countryman Mejow are closest to Soderberg at ten under par overall, while two shots further behind them are Sweden’s Simon Forsstrom, Italy’s Lorenzo Gagli, Chile’s Nico Geyger and England’s Max Orrin. The rounds of the day came from South Africa’s Oliver Bekker and Sweden’s Oscar Lengden, who both carded eight under par scores of 63 to climb into the top ten ahead of the final day in East Africa.